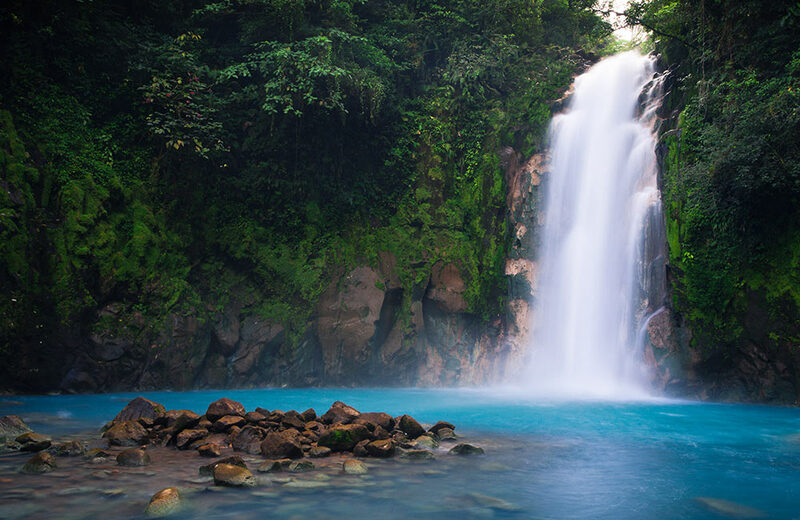 Waterfalls epitomize surreal beauty, spontaneity, and nature’s creativity. Set against delightful backdrops, these majestic works of art never fail to dazzle and inspire onlookers. These falls can be thunderous or they can be sublime, but each is a beauty in its own right. When you are in Pune, you can witness these stunning beauties in various forms, ranging from tranquil trickles to gorgeous cascades. Yes, Pune remains surrounded by waterfalls of all kinds, some of which take a plunge of hundreds of feet while others gush down just a few dozens of feet. You can approach some up close while some others remain aloof in the deep mountainous settings and can only be appreciated from a distance. All these factors notwithstanding, the waterfalls near Pune are a pleasure to explore on any day. So, when you are in the city, you don’t have to limit your sightseeing to temples, parks, museums, and palaces. 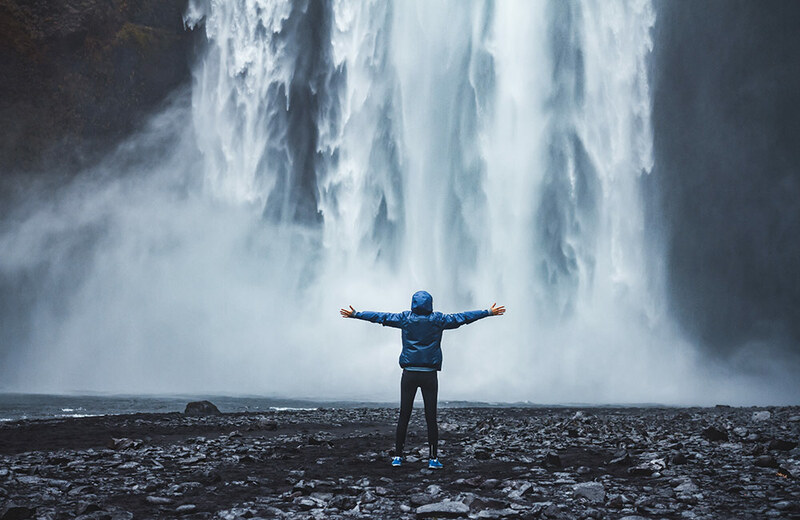 Instead, put on your best pair of sneakers and take a trip to one of the amazing waterfalls near Pune that are worth your time, energy, and enthusiasm. Here’s our handpicked list. There can only be one word to describe the beauty of the Tamhini Ghat mountain passage – captivating. The area remains adorned with scenic lakes and verdant greenery, making it one of the best weekend getaways for nature lovers. Enhancing the charm of this beautiful stretch are quite a few big and small cascades, of which the Tamhini tops the list. 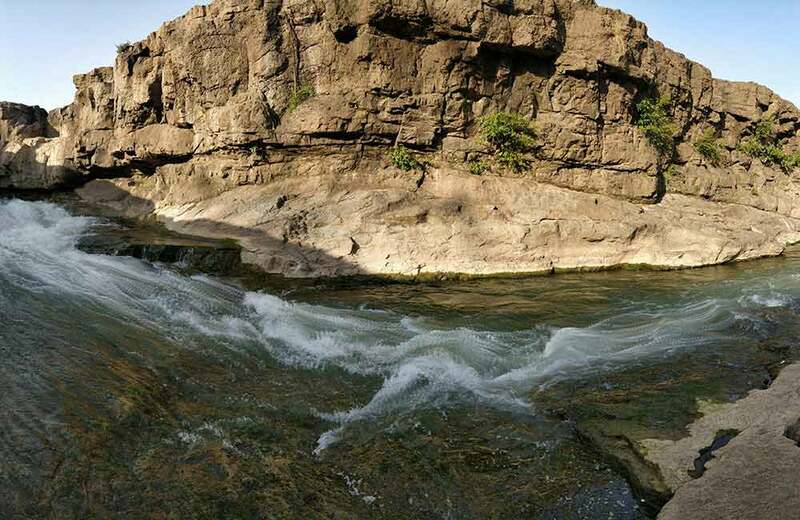 Located between Tamhini and Mulshi, Tamhini Waterfalls near Pune is at its gorgeous best during the months of August and September, when the monsoon rains enhance its volume abundantly. So, plan your trip accordingly. The rugged beauty of the ancient Bhaje Caves near Pune is perfectly complemented by the Bhaje Waterfalls, yet another must-visit attraction in the region. It is situated near the last of these 22 rock-cut caves that date back to the second century. If you happen to visit the place during or right after the monsoons, you will find the waterfall forming a small pool at the bottom. For those of you who love adventures and the rush of adrenaline, Bhaje Falls is a great spot for rappelling. It’s not without a reason that route to the Thokarwadi Dam is considered to be the best for a road trip near Pune. The distance of Thokarwadi Dam from Pune is about 66 km and will take you just about four hours for a round trip. But in those four hours, you will be able to witness quite a few stunning waterfalls, each of which cascades down and kisses the earth in a gush. 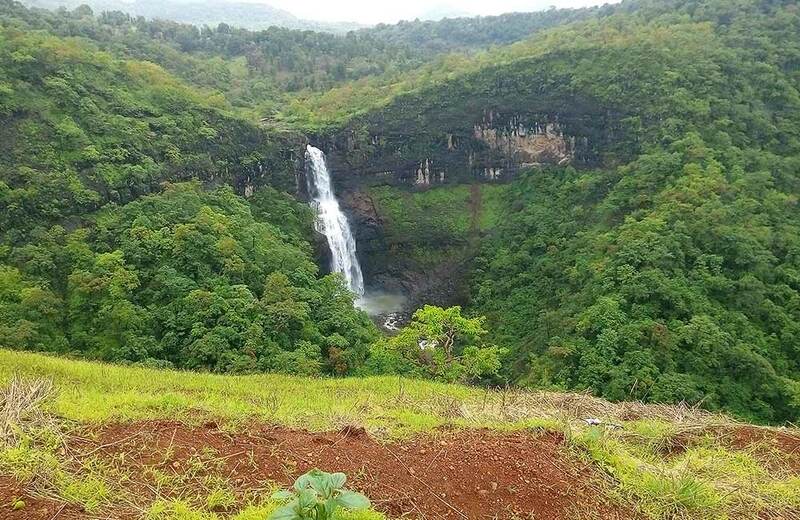 One of these falls, namely Thokarwadi is a modified natural waterfall and is located on a private property. You will have to pay around ₹ 100 per person to enter the property, but it is totally worth your money. As the water gushes down from a great height, it lands in a pool dug out at the base of the falls before flowing over a series of man-made steps. The whole scene is extremely striking, so shutterbugs, it’s a great chance to capture some postcard-worthy pictures. If you love clicking selfies, we have just revealed to you a great selfie spot! 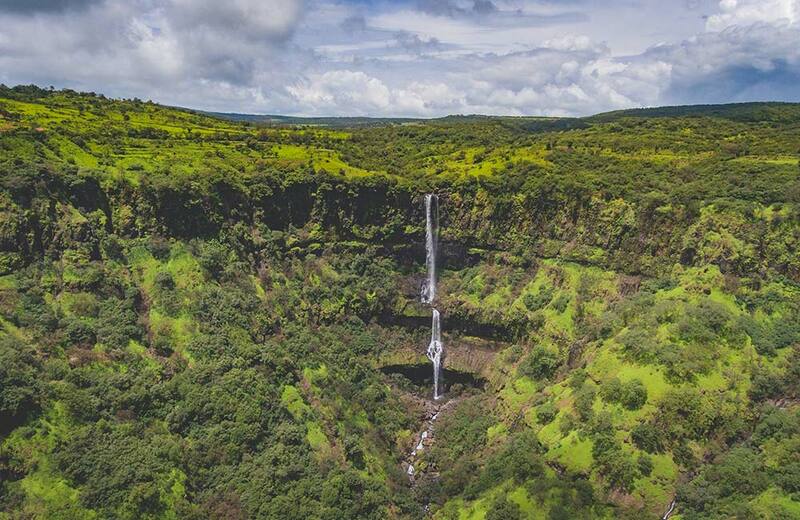 Take one look at the Kune Waterfalls and its surroundings and you will know why it is regarded as one of the most enticing places to visit near Pune. This scenic three-tiered waterfall is set against the spectacular backdrop of the Sahyadri Mountains and it cascades down a height of 200 meters, offering you an incredible view. Kune Falls takes pride in being the 14th highest waterfall in India. You can enjoy swimming and bathing here during the monsoon season, but you have to be a little careful. The Kune Church located nearby is also worth a visit when you are in the area. 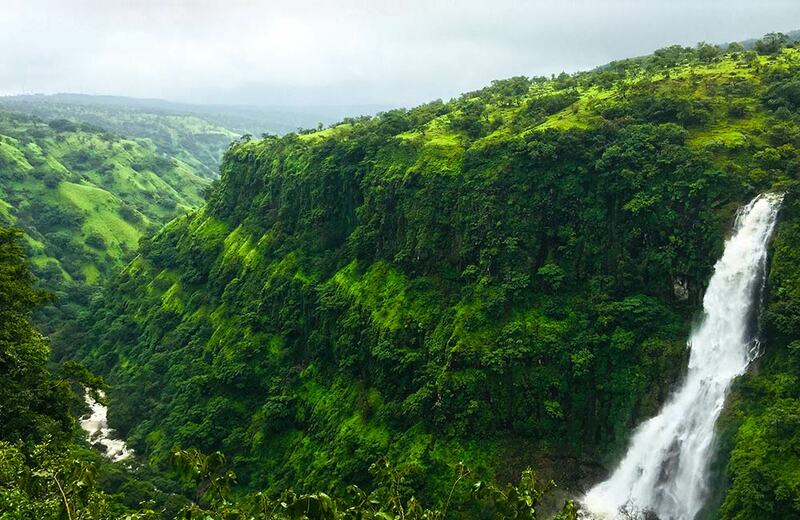 A wonder in the wild – that’s Devkund Waterfalls near Pune for you! 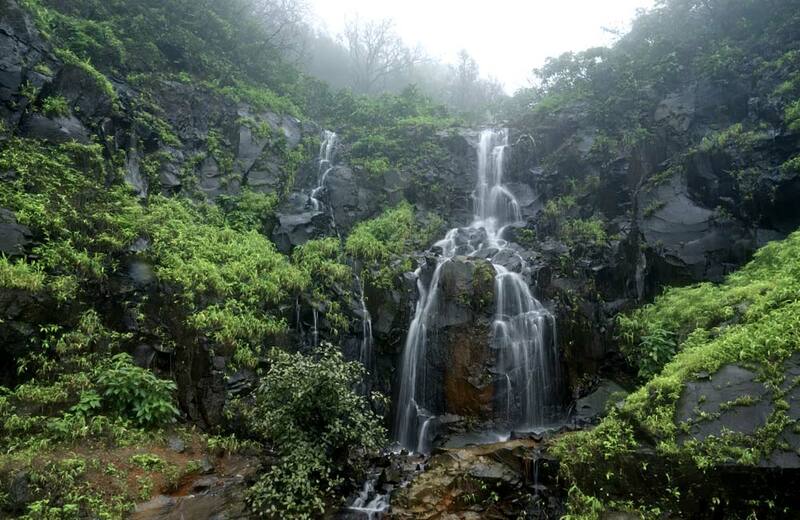 You will have to endure a trek of about three hours to reach this hidden waterfall near Pune. But once you reach the spot, the panoramic view will take your breath away! Devkund is a plunge waterfall that lands in a huge puddle on the rocky base underneath. Thanks to its magnificent beauty and location, it has become one of the popular picnic spots near Pune for the adventure seekers. Since the trek to the falls is through a dense forest area, it is good to have a guide with you to help you navigate through the region. Flowing amidst unspoiled natural surroundings, Lingmala is a gorgeous beauty with a height of 1278 meters. Interestingly, it is not one but two waterfalls combined into one – a mini waterfall and the main waterfall. 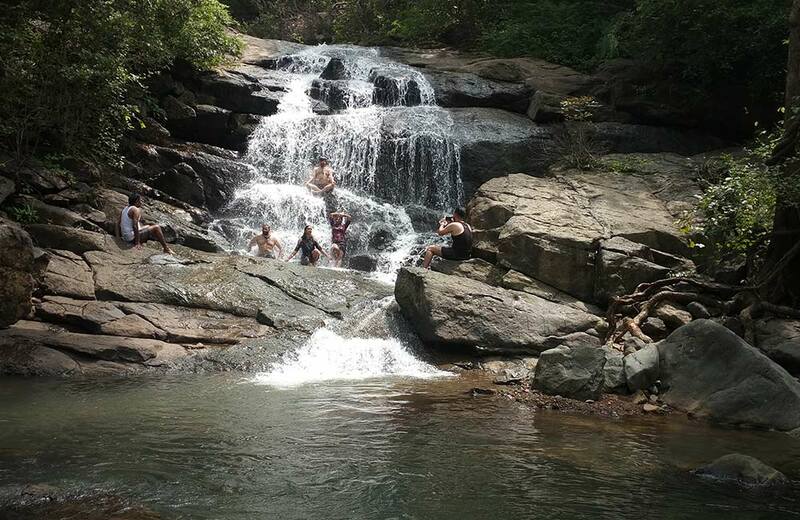 The mini falls plunges down a height of about 50 meters and is ideal for swimming. The main falls, with a height of around 500 meters, is the real treat to watch. You will have to walk for about 30 minutes to reach the site. As is the case with the other waterfalls near Pune in monsoon, Lingmala too becomes resplendent during the rainy season. Though you may not be able to get down in the water near the main waterfall, it is still a delight to watch it from a distance. Breaking the silence of the surrounding areas, Chinaman Waterfall gushes down 500 feet with a thunderous roar. The unique beauty of this waterfall lies in the fact that it starts as two separate streams, but halfway down the drop, the two streams merge to form a single voluminous fall that cascades down into a deep valley. Flowing against the backdrop of lush greenery, the majestic Chinaman truly creates a dazzling image. The Babbington Point offers an impressive view of this gorgeous waterfall. Thoseghar Waterfalls may not count as the largest or the wildest falls of the land. But it has a unique charm of its own. This spectacular waterfall is a chain of cascades, ranging from 15 to 200 meters in height. It is a seasonal cascade that takes on a splendid form during the monsoons. 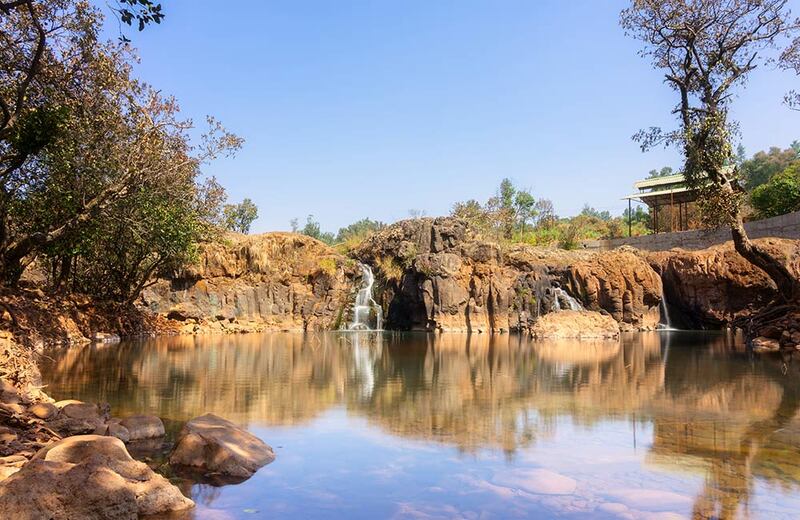 The tranquility of the area combined with the picturesque falls makes it a delight to visit for everyone, be it solo explorers, couples, or families out on a picnic. 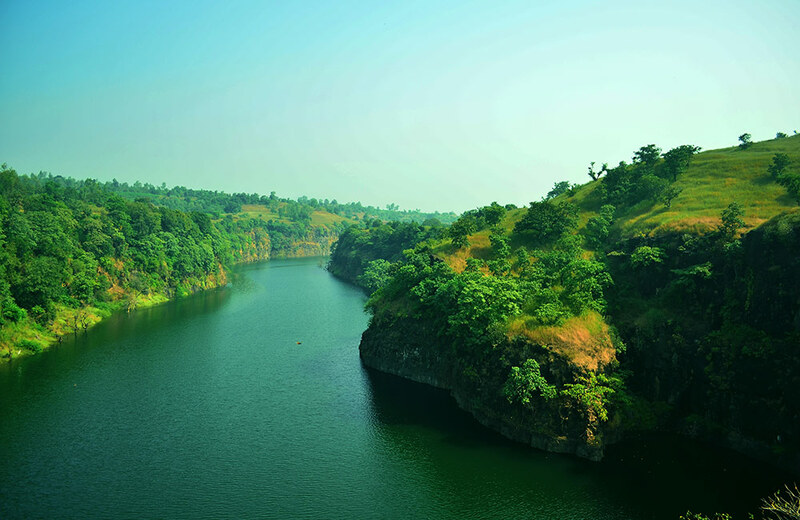 No wonder, Thoseghar is often regarded as one of the most popular weekend getaways near Pune. Vajrai Waterfall, aka Bhambavli Vajrai Waterfall, is a three-tiered perennial cascade. Dropping down from a height of 853 feet, it offers a spectacular sight to the onlookers and is a trekkers’ paradise. This waterbody is believed to be the starting point of the Urmodi River. A trek of 500 meters will take you to the base of the falls. 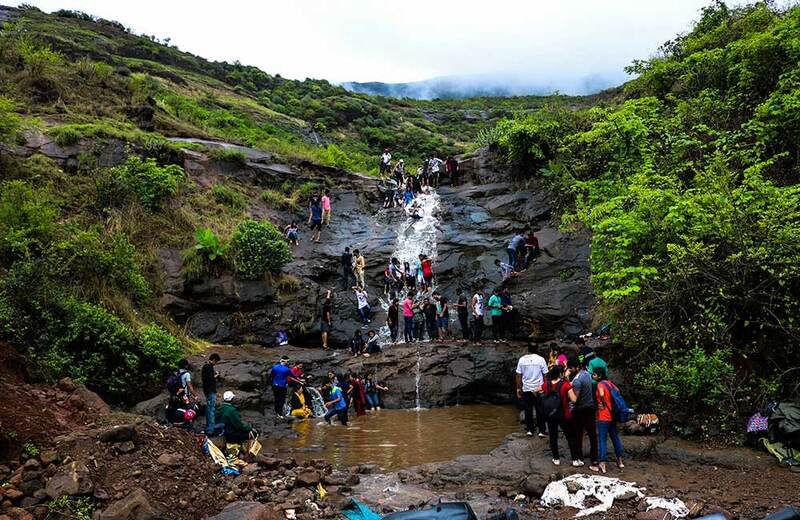 Though the trek is an adventurous journey that culminates into a glorious sight, it can become risky during the monsoons to make your way through the slippery path leading to the site. So, tread with care. 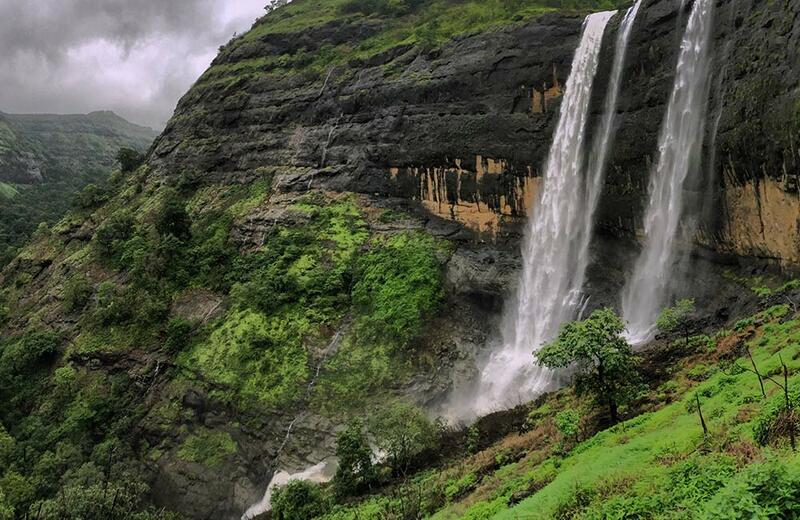 Located less than 200 km from Pune is one of the most dazzling natural wonders of this region, namely the Randha Falls. 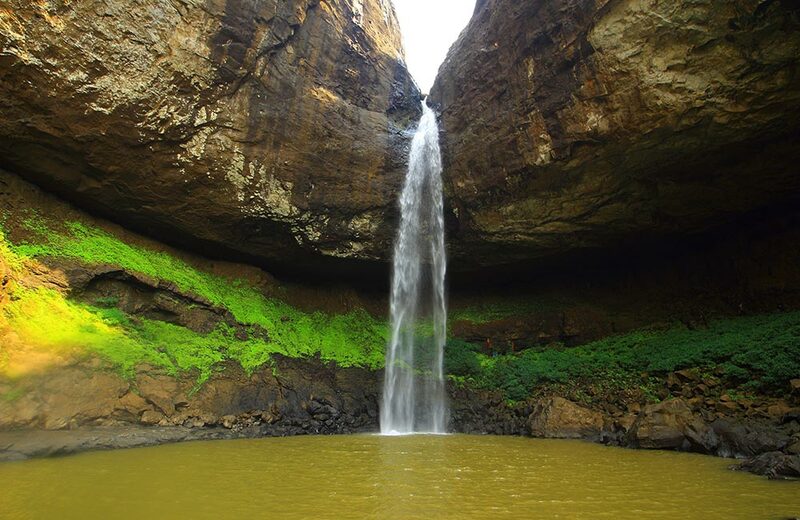 River Pravara takes a plunge down a height of 170 feet into a deep abyss to form this spectacular waterfall. It is a treat to watch the clear water of the river gushing down in abundance into a ravine and this is what primarily attracts tourists and local folks to this waterfall. The period from July to October – i.e. the period during and after the monsoons – is the best time to explore the beauty of this waterfall. Location: Ratangad to Rajur Road, Ranad Bk. Come monsoon and Kataldhar becomes alive and glorious. Thanks to the heavy rains in the region, this seasonal waterfall dances down its way to present a captivating sight. Though the waterfall exists no better than a trickle for the most part of the year, the rainy season enhances its beauty and volume and makes it a sight to behold. Reaching the site of the falls is not an easy task, but the sight that awaits you at the end of your endeavor is definitely worth the effort. Considered to be one of the most beautiful waterfalls in Maharashtra, Umbrella Falls is a seasonal delight resulting from the overflowing of the Wilson dam during the rainy season. As the dam reaches its maximum capacity, water jets out through a small opening in the northern side that exists over a rock and results in the formation of this lovely waterfall. You can get a complete view of this waterfall by standing on the bridge right below it. Have you ever heard of a gravity-defying waterfall whose water rises upward in a show of defiance to nature? If not, then you need to visit the Reverse waterfall in Sandhan Valley. Though it is not the official name of this falls, it is often referred to by this name due to this amazing phenomenon. Located near the Samrad village in the Bhandardara region, this site is an absolute delight to watch and for all the right reasons. Though it might sound unbelievable, water does move upwards here. The reasoning behind this is that high winds hitting the area create an updraft force that makes the stream of water to blow backward, which in turn results in the reserve waterfall. 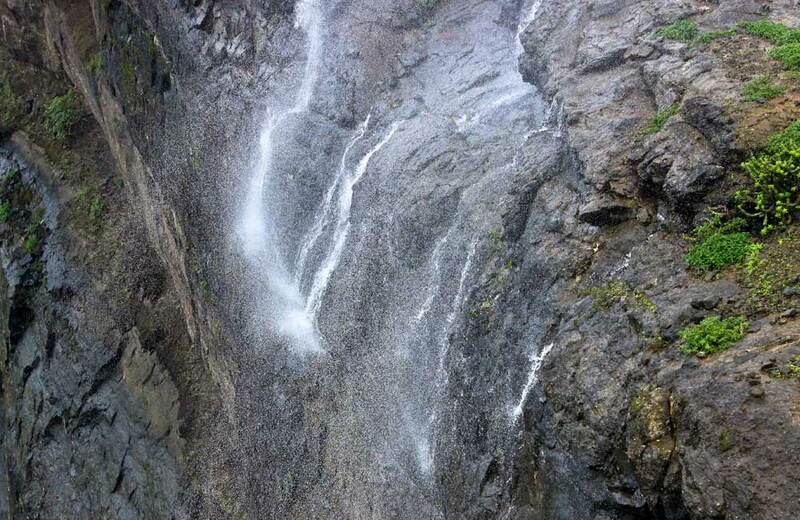 While this is a rare phenomenon, there are a few other reverse waterfalls in Pune as well. Deep inside the Tungareshwar National Park flows the mesmerizing Chinchoti Waterfalls. 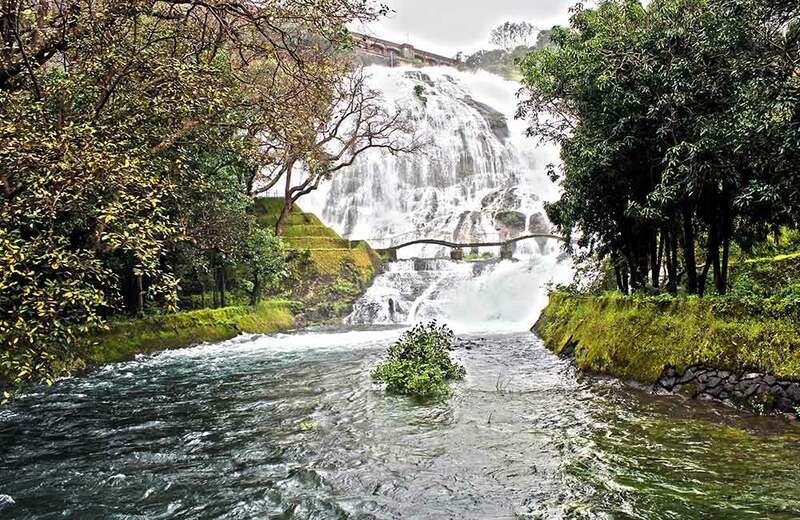 Also known as Tungareshwar Waterfalls, this natural wonder remains surrounded by dense trees. Since it is situated at a height of more than 2000 feet, you will have to embark on an adventurous trek to reach it. If you are in the vicinity of the hills, do not miss out on exploring the Tungareshwar Temple, which is another major attraction of the area. Someshwar Waterfalls may be small in size, but that doesn’t mean it is any less in beauty. The picturesque cascade formed over River Godavari has a height of just 10 meters and is located in close proximity to the famous Someshwar Temple. During the rainy season, the surrounding greenery enhances the beauty of the waterfall by many notches. A popular hangout spot of the youngsters, it is also the preferred picnic location of the family crowd. 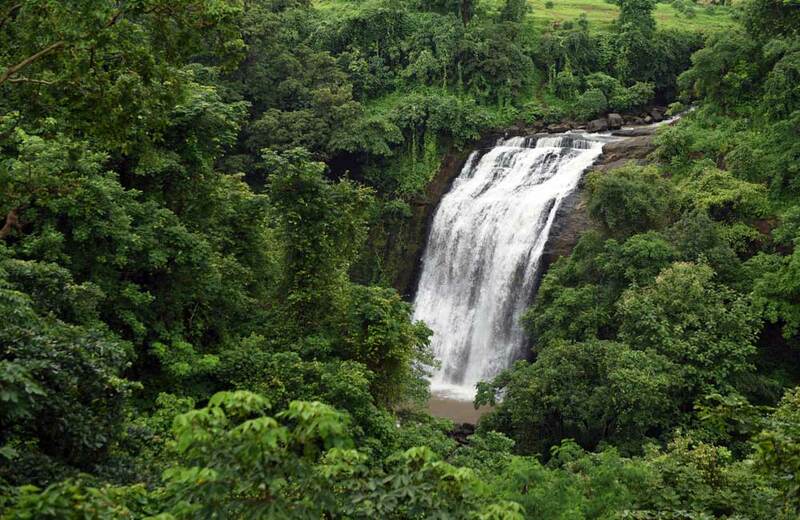 Vihigaon Waterfalls is a celebration of the primal force of nature during the monsoon season. 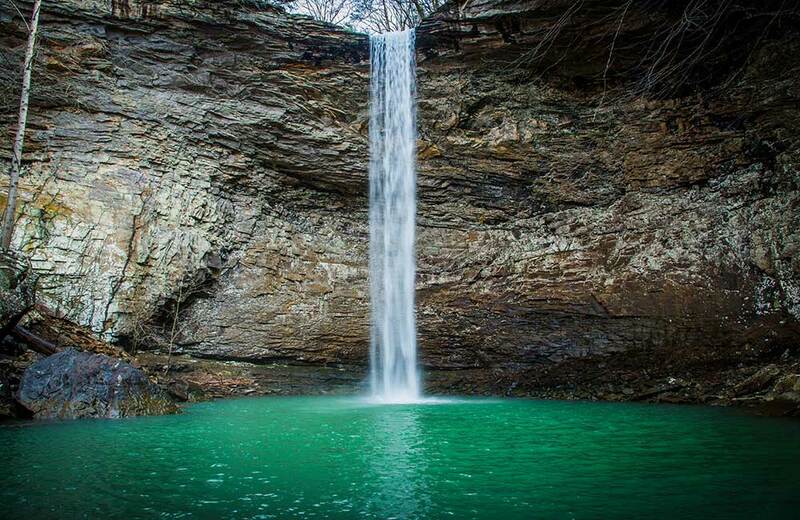 This seasonal waterfall cascades down from a height of about 120 feet before it reaches the pool beneath. The sheer pleasure of watching this waterbody in its full glory is reason enough to explore it. Its location in a deeply forested area offers the perfect spot for adventure seekers to indulge in exciting activities, including trekking and rappelling. Nestled amidst green surroundings is the Dugarwadi Waterfalls, which is regarded as one of Maharashtra’s best natural beauties. The falls, the engulfing forest, and the tranquility of the area all come together to create an inviting ambiance, drawing visitors all through the year. If you want to forget the stress of daily life and enjoy some time in the company of nature, head out for this waterfall without a doubt. Waterfalls are always a delight to explore, aren’t they? So, why not plan a trip to these lovely spots on your next visit to the city? All you need to do is check into one of the hotels in Pune, wear your adventure cap, and get on the road. Let the adventure begin and get ready to listen to nature’s unending symphony.